Fanaticsm, racial profiling, feminism, generation gap, lost identities of people moving from the East to the West - Khuda Ke Liye covers it all with a good forceful impact in the end. For movie-lovers, just the fact that Khuda Kay Liye - a Pakistani movie - has found its way into theaters in India is a good enough reason to rejoice. This is certainly a move in the right direction with other internationally acclaimed movies (Lives of Others, 4 months, 3 weeks, 2 days) being screened in mainstream cinema halls. I am sure they wont find an audience in the interiors, but well-begun is half-done, right? I can't decide what moved me more. The way in which the author's take on Islam - the use and abuse of the religion - unfolded, or that someone even dared to touch upon it so openly in the first place, that too in Pakistan. I think there would be very few makers for this kind of a story even in India - a secular state. And by the climax, I was amazed at the number of issues Khuda Kay Liye touched upon. We had the whole gamut. Atrocities faced by women at the hands of fellow-Muslims, double standards of Muslim parents living abroad (I have seen this with non-Muslim Indians too), injustice disseminated because of racial profiling, Jihadi's misuse of easily-influenced-relatively-meek youngsters to turn them into terrorists. Each problem is given its own space to breathe and develop. The parallels drawn between the racial profiling storyline based out of Chicago and all the other things happening in Pakistan were amazing. There are points where you can interchange the US law officials with the Jihadi leaders in terms of their unyielding attitude towards whatever they believe is the truth. How they all mince words to have people say what they want to listen to. And to make sure the audience doesn't miss the parallels, the similarities are directly shown towards the climax. The strong and clever dialogues had a huge role to play in the overall impact In the name of Godhad. I was wondering how much more effect it would have had on me had I understood the language completely. The use of Urdu is elegant, and at the same time not entirely overwhelming. Since the movie is more or less situation-driven you can make a fair guess from the context. However, there was a lack of the same aptitude in the departments other than story and dialogue. In particular, the editing was very abrupt and didn't render a smooth flow. The only exception was in the climax scene in the courtroom, where the cuts worked towards narrating the story. Similarly, while the songs were beautiful, the shifts in and out of western classical in the background music seemed pretty random. Most of the actors too came across as very stiff. Only, Shan (Mansoor) stood out with an excellent performance - from the inspired musician to a completely broken down man. 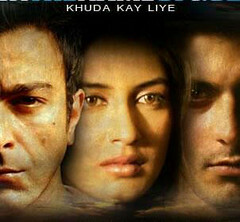 Fawad Khan who played a confused youngster, Sarmad, did look aptly baffled. So it would be too soon to judge whether he can really enact other emotions. But, given the strength of the message all these shortcomings seem pardonable. The questions that I am left with are - Has it reached the right ears? Or at the very least have the people sitting on the fence convinced to keep from committing such heinous acts? Yay! Thumbs Up, by Last Longer In Bed : Great. Two musically gifted brothers, Mansoor and Sarmad, come from a non-conservative Muslim family. Mansoor heads off to the US and Sarmad wants to follow the Jihadi's interpretation of Islam. Both of them suffer at the hands of people whose ears are closed to beliefs other than their own. Speech on what Islam really is delivered by Naseeruddin Shah. The exteriors and interiors of Mansoor's house didn't match. Good message, but the screenplay is overburdened with too many complexities, social and religious. Was it necessary to tackle all the problems in one single movie? The editing and the delivery were not seamless. I feel the best part of the movie was Naseeruddin Shah's dialogues and the message he provides. Its a 6.5 on 10 for me. idivan has posted 1 comments and has rated 0 movies. See idivan's page for more details. This movie is absolutely wonderful.Thnak you! Last Longer In Bed has given this movie a Yay! Thumbs Up(Great.). Last Longer In Bed has posted 1 comments and has rated 1 movies. See Last Longer In Bed's page for more details. shaizal has given this movie a Yay! Thumbs Up(100). shaizal has posted 1 comments and has rated 1 movies. See shaizal's page for more details.